These creative sisters show us how they tastefully combined their two different personalities. No sibling rivalry here! It’s hard enough to share a space with your brother or sister, but what if he or she has a very distinct personality, and in turn, a decorating style that is different from yours? 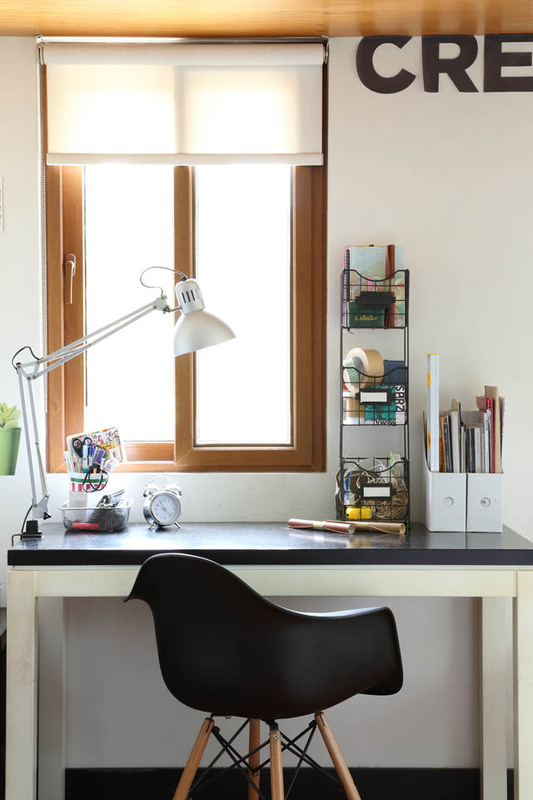 Designer Mara Manalo and her sister Joana, a college student, open their doors to show us how they were able to merge their two different, personal styles into a cohesive space. For one, both sisters know when to compromise. “When we were growing up, I always imitated kung ano yung gusto niya,” Joana (above, right) says with a laugh. And while Mara (above, left) seems hesitant to acknowledge the extent of her influence on her younger sister’s taste, she does admit to helping her out with her room. Naturally so, as this ate is a licensed interior and production designer (read more about her extensive body of work—and how her bedroom has evolved—here). The two, though, have slightly varying preferences: Joana is partial to solid colors and sporty décor, as seen in her room that has one wall swathed in dark charcoal gray. Meanwhile, Mara is in love with white walls made interesting with bold and quirky accents. “I like na medyo raw. Ayoko ng super polished. I’m more of the girly side, tapos si Joana sporty ’tsaka boyish,” says Mara of their respective styles. Buy big furniture items together. Choosing large pieces together like a dining set of sofa ensures a cohesive look. This white sectional sofa pairs perfectly with these summery pillows that Mara sourced from a department store. “I like sourcing from affordable shops,” she says. Incidentally, the sofa is similar to the couch Joana has. 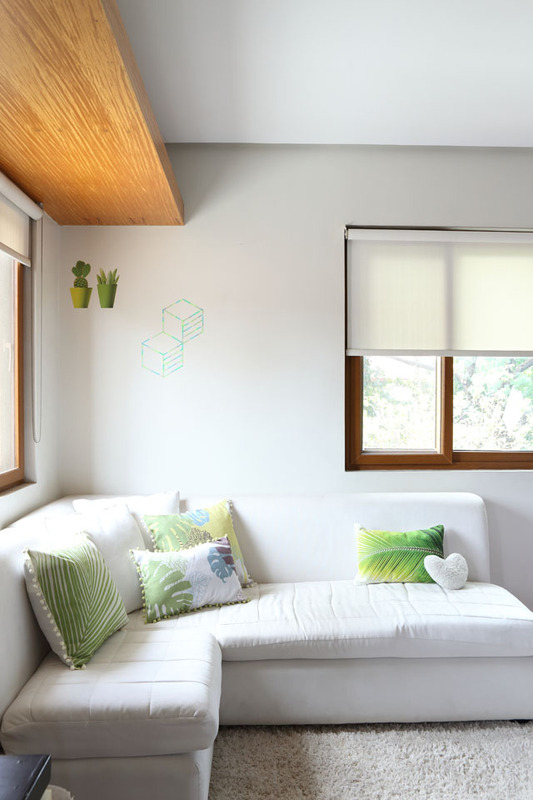 Mara added cactus stickers and washi type patterns in one corner of the wall for an off-kilter look. You can find pillows like these at H&M Home. Look for pieces that are similar to your sisters’ decor. 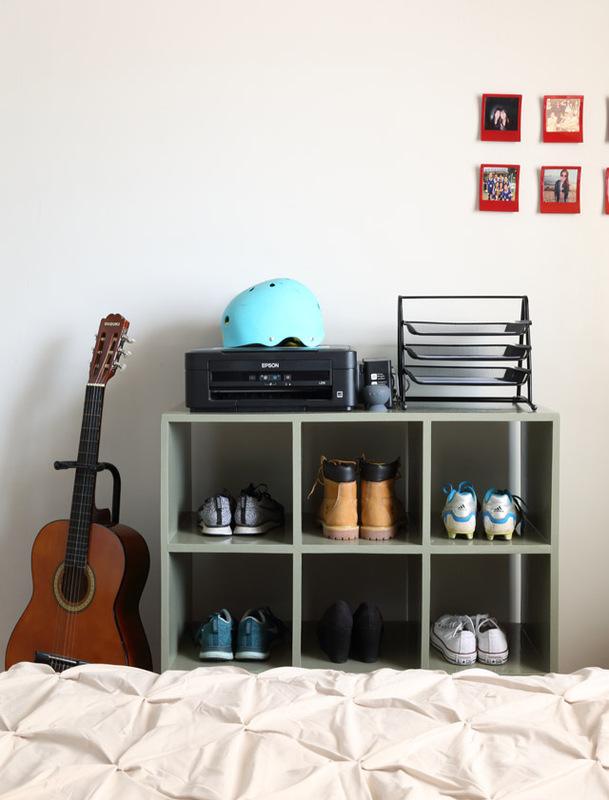 If the identical storage cubby in Joana’s room houses her shoes, this one in Mara’s sleeping area houses the young designer’s collection of books and cameras, and a few plush toys that add more quirk. Meanwhile, wall decals keep the plain white wall from looking clinical. Find similar decals at True Value. The all-white walls in Mara’s bedroom are a blank slate that she can play with as an interior designer. The clean palette also keeps everything cohesive, given Mara’s playful decorating style. 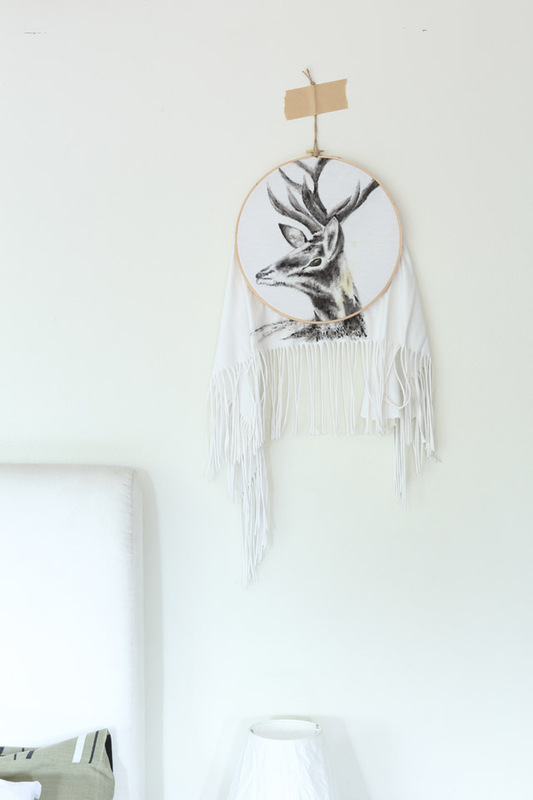 Here, with an embroidery hoop, a plain shirt, and drawing skills, Mara was able to ingeniously come up with this one-of-a-kind wall décor. In one corner of Mara’s bedroom is this work area, which sits right beside her pet cat Frankie’s nook. On this wall, Mara used crafter’s tape to spell out the word “create.” Mara uses the same midcentury chair as Joana’s, only in black. Complement or contrast each other’s spaces. The charcoal gray walls and dark gray rug are a testament to Joana’s penchant for solid colors, lending a more moody tone to the college student’s private space, and a stark contrast to Mara’s all-white sleeping space. A desk lamp on the bedside table gives Joana an option to study in her room, but she finds the space too conducive for sleeping that she’d go downstairs to their living room to pour over her textbooks. 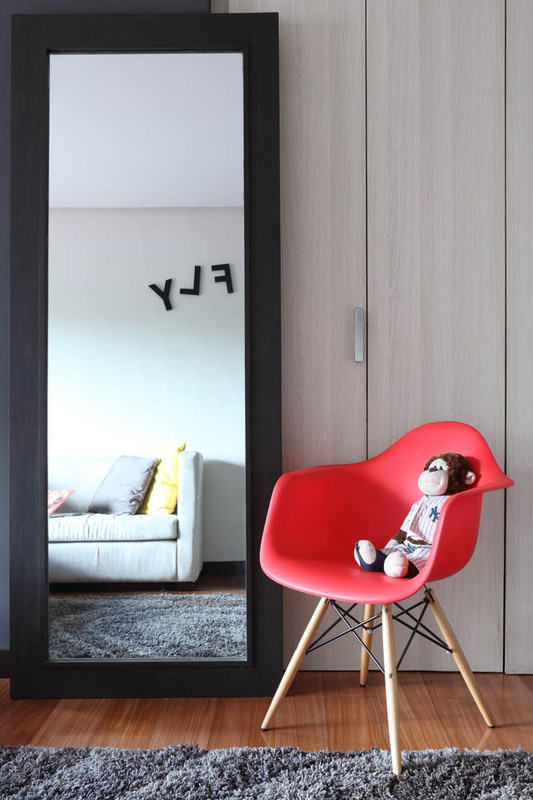 Even though the layout of both girls’ bedrooms—plus the furniture pieces—look somewhat similar, it’s the details that giveaway the sisters’ varying personalities, such as the bright accent colors in Joana’s room as seen in the red midcentury accent chair (Mara has the same chair in black). The closet behind this mirror is actually Joana’s study desk, which she rarely uses. Decorate with items that show your respective hobbies. 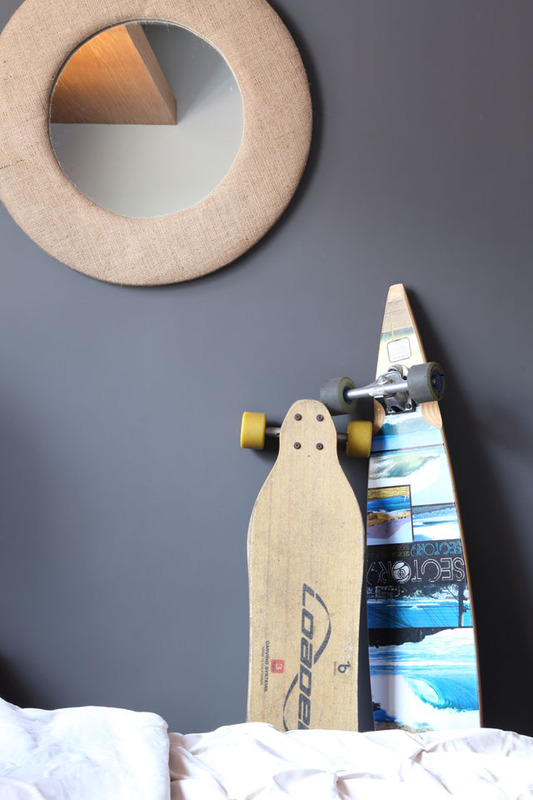 These skateboards attest to the sister’s completely different personalities—Joana, being the sporty one, is proud to put these on display in her room. On the other hand, nothing of the sort is found in Mara’s. You can get a similar mirror from Our Home. If there’s one piece in the Manalo’s sisters’ bedrooms that best describe their personality, it’s this cubby. Both girls have the same piece, albeit in different colors housing completely different items. Here, it holds Joana’s collection of shoes, most of which are sneakers. The original article "Sister Style" appeared in the June 2015 issue of Real Living Magazine.